Page last modified 09:16, 9 Apr 2010 by user0? That night, I entered SL a few minutes before 1 am, at my home entrance point just in front of my hut, about 50 meters to the west of the pavilion. Fael walked by and we greeted each other. A few minutes later I walked up to the pavilion, joining Fael again. Fael Illyar: Ah, offline IMs? Fael Illyar: Yes, they’re a bit easy to forget. Fael Illyar: most shopowners require you to drop them notecards or they refuse to do anything. Fael Illyar: Yes, SL is missing a proper built-in email system. I couldn’t agree more! And yet, like with everything, there are two sides to each observation, and we started talking about OpenSim. Pema Pera: same reason as why the qwerty keyboard doesn’t go away . . . .
Fael Illyar: There’s still plenty of people with no experience with virtual worlds. Pema Pera: true, but the first qwerty keyboard was probably used by less than a million people too . . . . .
Pema Pera: a million is a lot ! Fael Illyar: the decision making mechanics for which to choose was a bit different back then. Fael Illyar: that ended up with most people using that. I mentioned Linus Thorvald, the Finnish hacker who started the open-source project around the Linux operating system, by making his own first attempt to write such an operating system publicly available back in 1991. Pema Pera: hehe, your fellow countryman Linus comes to mind . . . .
Fael Illyar: I’m not sure what you’re getting at. Linux is quite a moving target. Fael Illyar: not comparable to qwerty in that :) It’s been unchanged for decades. Fael Illyar: Yes, unlikely but that doesn’t mean it stops improving. Fael Illyar: Linden Labs versus OpenSim … OpenSim has potentially much more resources in it’s disposal. Wouldn’t surprise me if LL ended up running OpenSim in a few years. Fael Illyar: I think LL realizes that as long as their platform is closed, they don’t have a chance at being part of the eventually evolving virtual world ecosystem. 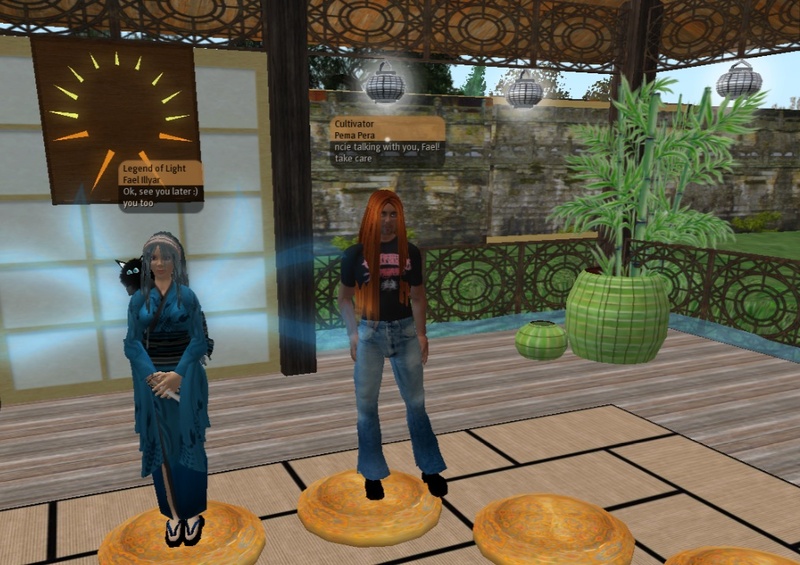 Pema Pera: yes, and it is remarkable realization — by far most companies don’t realize such things . . . .
Fael Illyar: If LL stubbornly ignored OpenSim, they’d eventually be marginalized and no say in what goes on where. This way they can even keep partial control of where things go. Fael mentioned realXtend, yet another Finnish innovation. Pema Pera: Is realXtend mainly an interface? Fael Illyar: just much better tools for content creators and more possibilities for things. Fael Illyar: a bit harder to use though so it’s not without it’s downsides. Fael Illyar: you can have non-humanoid avatars for a change. Pema Pera: much better than from 1 I guess! Pema Pera: nice, looking forward to seeing that! Pema Pera: they are Finnish? Pema Pera: do you know why Finland is so ahead in many of these things? Pema Pera: small-number effect perhaps? Pema Pera: a fluctuation of a few interesting people getting together, then attracting more interest and activity? Pema Pera: creating a culture? Pema Pera: and I’ll have to leave in another 5 or so. Fael Illyar: ok, that’s quite a few at once. Pema Pera: have you met all of them? Fael Illyar: the others don’t really surprise me. Yes I’ve met them. Fael Illyar: How many didn’t pick a weekly slot? Fael Illyar suddenly remembers you can be a bit forward with that. Fael Illyar: Just remembering getting pulled in myself after less than a week. Pema Pera: well, but your first week was, what, 20 sessions? Fael Illyar: no, not that many. 2 per day. Pema Pera: ah! Now I understand. Pema Pera: I must have counted Fael and Faenik separately, adding them up . . . .
Fael Illyar wonders if that’s supposed to be a joke? We talk about the way guardians are chosen. Fael Illyar: Well, you have your personal rules I’d think. Pema Pera: would you like me to check with all of you before inviting someone new? Fael Illyar: So far that hasn’t been a problem I guess but it has the potential to become one as the group grows. Yes, Fael had a goint point. I thought about that a bit more, after the meeting, and I then decided to propose to the guardians to change the procedure: instead of me inviting new guardians myself, letting everyone bring up names during our weekly meeting and discussing those. Then, after reaching agreement, any or us guardians could approach new candidates and invite them. Fael Illyar: meeting sizes at least would need to be controlled somehow. Fael Illyar: yes, potentially too many logs soon for anyone to read alone. Fael reminds me of time passing, even though as an astronomer it is my traditional task to keep time . . .
Pema Pera: I feel that if someone would dig out the gems, a small book with hundred pages could easily be formed from what we already have, and might well be very interesting by itself . . . . and in a year we’ll have vastly more. Fael Illyar: Yes, the gems are there. Pema Pera: and then parallellizing? Fael Illyar: the number of guardians currently doesn’t really allow for too easy addition of the number of meetings spaced away in time but one could potentially handle two meetings at once … well, if not for the log. Pema Pera: well, I’d better run — many possibilities to ponder! Pema Pera: ncie talking with you, Fael!